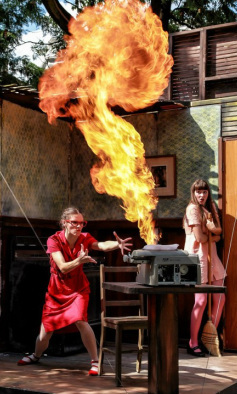 Redmoon Theatre's Urban Intervention Series, featuring Dis/Re Placement, an exploration of the human need to connect and the neuroses that keep us apart. A serio-comedy told on a forklift that reaches 25 feet into the air, utilizing fire and smoke, bubbles and water. Lots of water. Reflections is a two-person clown and circus piece developed for and produced by The Actors Gymnasium. The package consists of a half-hour show followed by an hour long class. Two clowns, one real and one reflection, though we never say which is which, encounter one another in a mirror. When one clown gets pulled through, it leads to an exploration of the fear, frustration and discovery we encounter when our self-image differs from our experiences in the world. Please contact The Actors Gymnasium at email@actorsgymnasium.com or (847) 328-3495 if interested. Also commissioned by The Actors Gymnasium, The Secret Circus is a clown and acrobatic show in development for 2013. Lacy Katherine Campbell's beautiful brainchild. 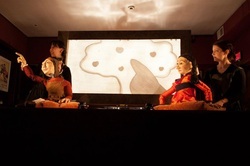 Then, One Night is an entirely text-free celebration of storytelling incorporating visually stunning projection and puppetry to unite all ages and nationalities.